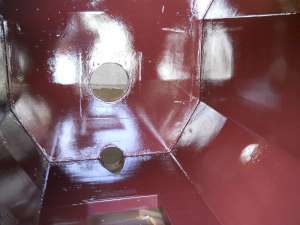 Composite Industrial Group, Inc. has the capability to apply 100% solids coatings without using any solvents by utilizing heated airless spray equipment or plural component airless spray equipment. Many severe environments that include elevated temperatures and/or strong chemicals require a coating system that will go above and beyond most others on the market. This tank at a steel mill required a coating that would hold up to strong chemicals and Composite Industrial Group, Inc. had the solution. 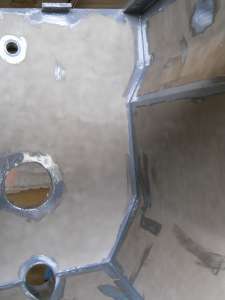 We applied two (2) coats of 100% solids epoxy for a total film thickness of 18-24 mils. This project saw minimal downtime due to the fast cure times with these coating systems.